This project made provision for interpretative dyke features located in the area of the new Coastal Trail paths. Key points for interpretative features were identified in the Community Interpretative Plan. A design for interpretive seating using traditional drystone dyking was produced and certain trails were identified as being appropriate. Dan MacRae was responsible for the craftsmanship of the stone seat on the Beechwood path. Mane of local stone and engraved in both Gaelic and English, if offers a welcome rest for those out walking. Again Dan MacRae created the seat overlooking a spectacular view of Skye . The seat is sheltered from the elements and is a much simpler design than that of the Beechwood path. This was the first of the seats created, this one very artistic and rustic and fits perfectly with the Smiddy Wood walk. All of these seats have been very welcome to those out running and walking and even biking along the trails. 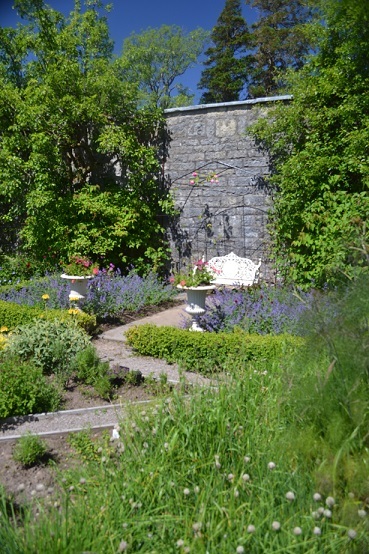 An interpretive seat was made and placed within a section of the Walled Garden. This patch was dedicated to the traditional Victorian herb garden, with lavender, thyme and sweet smelling roses. The seat will be accompanied by a book for visitors to write a line of poetry.